Easy and Moist Kumquat Ginger Cake: This is a perfect spring-summer cake filled with citrus flavors that are enhanced by a hint of ginger. Moist Kumquat Ginger Cake is moist and the taste transports you to delicious heaven. 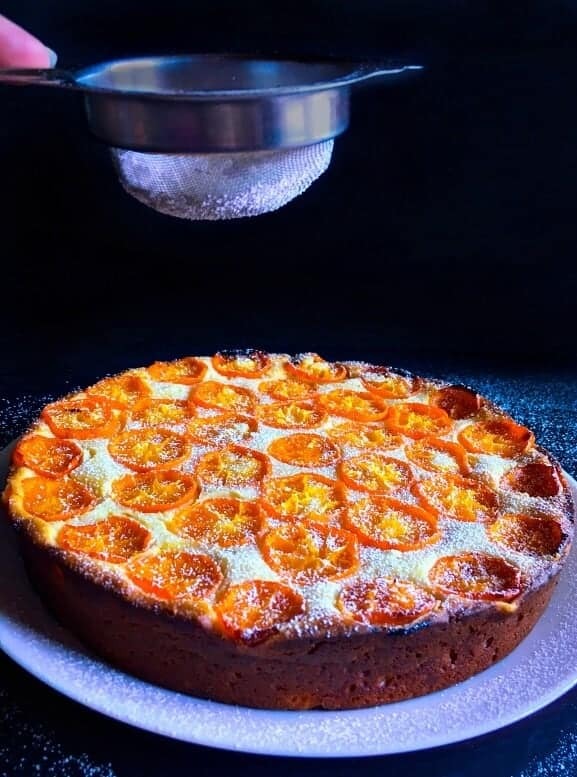 This whole week has just passed in such a jiffy but before the weekend starts, I wanted to share this gorgeous Easy and Moist Kumquat Ginger Cake with you’ll. 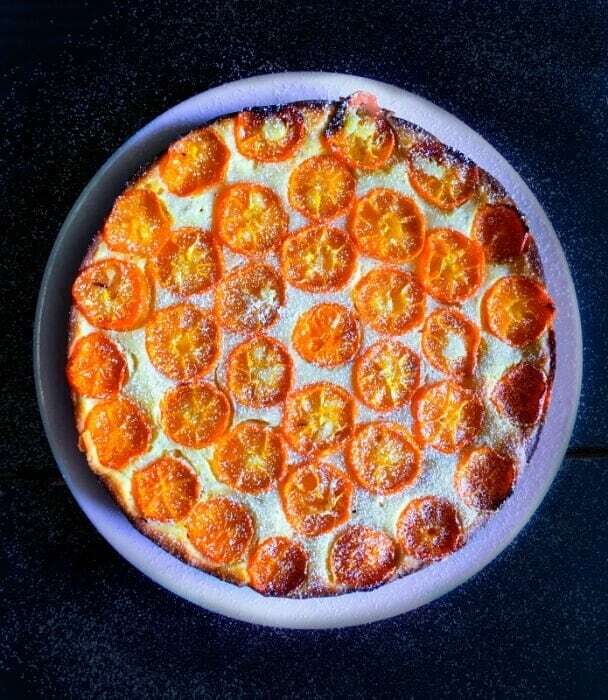 You won’t believe that I’ve been thinking of sharing this amazing cake recipe with you’ll since last year but just didn’t get a chance to buy fresh kumquats and make this. I love desserts more than savory food and on top of that, I love citrus flavored desserts from tarts, cake, muffins…you name it and I’ll find a citrus version. Especially after the long harsh winter that we’ve had this time, I’ve been craving my spring-summer fruits, sunshine, beaches and just everything green and colorful. We’ve had tons of rains and gloomy weather here in California, so this cake was such a refreshing change that we all needed. I did make it for a small gathering with friends and most of the cake was gone…except 2-3 slices which I packed for a friend who couldn’t attend. 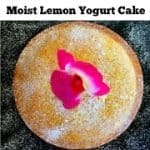 If you’ve been reading my blog, then you might have come across my ‘Moist Lemon Yogurt Cake’ and this is something similar but with an orange flavor and a bit of cream cheese. 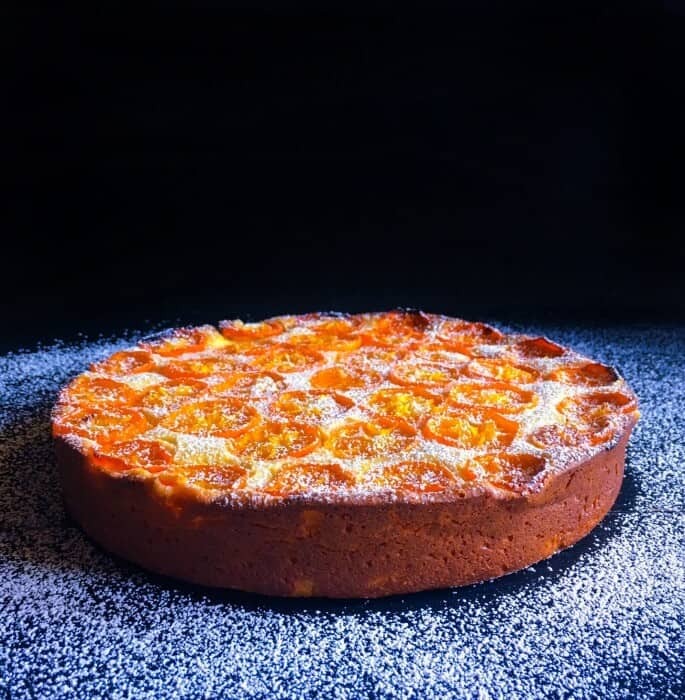 Now, you can make this cake similar to the lemon cake recipe, however, the kumquats had this slightly more citrusy flavor which at times make desserts taste slightly more tart than needed. 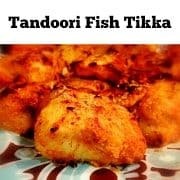 So the cream-cheese tone down that tartness and also adds a layer of soft crust on top…which when you bite into is pure luxury! I mean words cannot do justice to the delicious piece of yum this cake is…you have to try it to believe how amazing it is and don’t worry, it’s absolutely easy to make too. I also added some freshly grated ginger to the cake batter to enhance that perfect citrus flavor and then added thinly sliced kumquats on the top (which have been soaked in a mixture of sugar, orange juice and ginger). That’s it for now, Hope you try this Moist Kumquat Ginger Cake soon and have a Great Weekend ! This Kumquat Cake is a perfect spring-summer cake filled with citrus flavors that are enhanced by a hint of ginger. Preheat the oven to 350F (175'C). 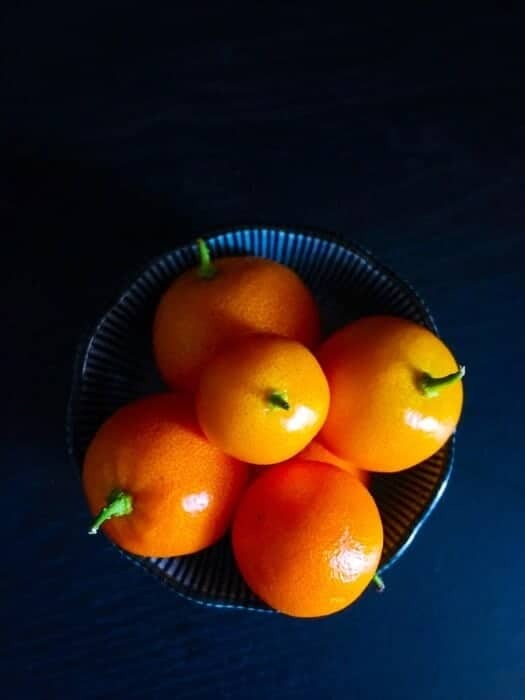 Mix sliced kumquats, 1/4 tsp ginger and sugar together. Keep aside. Add oil, kumquat juice, grated ginger and whisk again to form a frothy batter. Spread the cream cheese evenly on top of the batter. 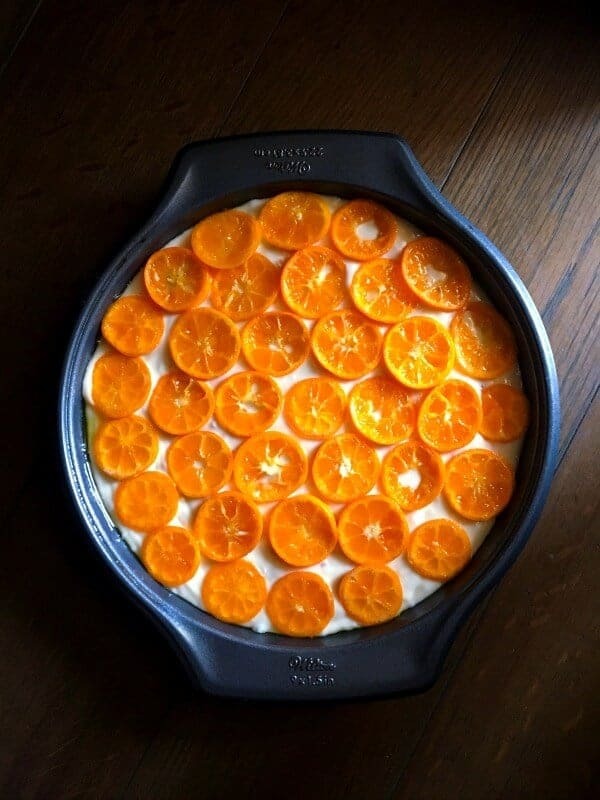 Place the mixed kumquat slices on top. 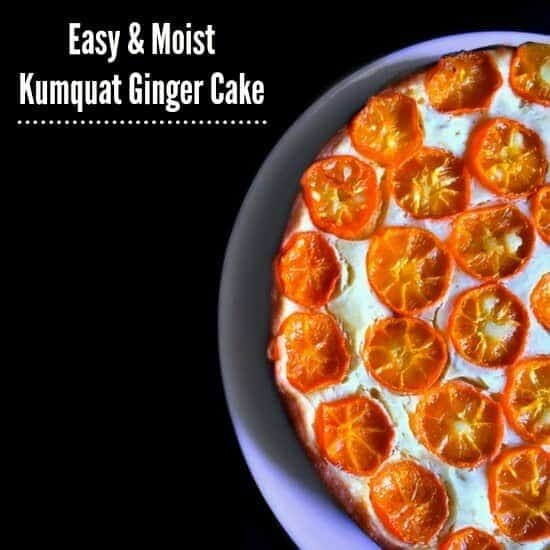 25 Replies to "Moist Kumquat Ginger Cake (Easy & Quick Recipe)"
It’s Kumquat season again. Your recipe was a welcome idea. 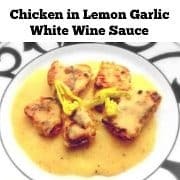 I made it last night and it was quite delicious and enjoyed by all my guests with some added whipped cream. Question: how did you get the “whipped” cream cheese to spread across the top. I whipped Neufatchel and it was still pretty chunky. I put little dollops all over the top, which worked. Maybe I needed the extra fat in “real” cream cheese. I love desserts. I’ve never had a cake with kumquats before. It sounds like it has a very interesting flavor. Citrus flavored desserts and spring go hand in hand if you ask me 😉 This cake looks absolutely gorgeous Molly. 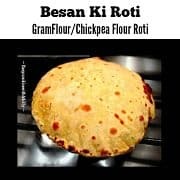 I love that it has ginger inside. I can’t wait to try this cake. Since we don’t have Kumquat I’ll sub it with oranges. I just had to google kumquat. Oh my, I’m so embarrassed! Molly, this is such a superb cake. I love how pretty it is! The only thing I wish to see is a big slice of it cut out. There isn’t a photo of the inside of the cake. That is one of the delicious cake near my old house my neighbor has kumquat tree. 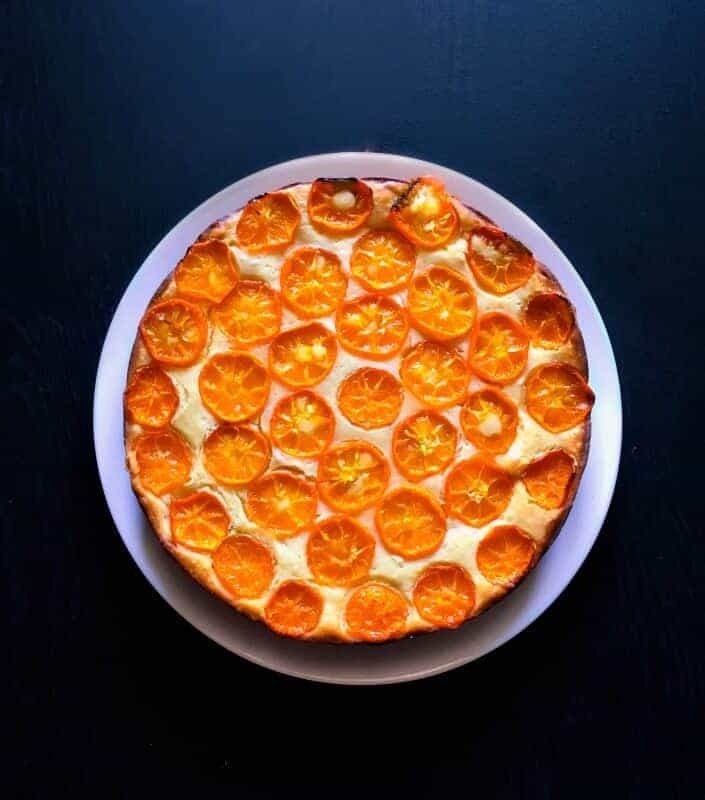 I miss now, when I can get hold of some kumquat I will try to make this cake, always citrus and ginger makes best combination. 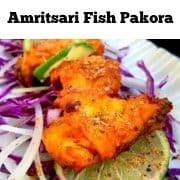 What a delicious flavour combination. I love the photos, your cake looks soooo beautiful. I love anything ginger. I have never used kumquat before. I have seen them in the grocery store…but not very often. This cake sounds delicious and would be perfect for my afternoon tea/coffee break. Looks delicious, Molly! I just saw some organic kumquats in the store today. They looked so beautiful, but I had no idea what I would do with them. Now I know! I love Kumquats but have not seen them here. Must look out for them. 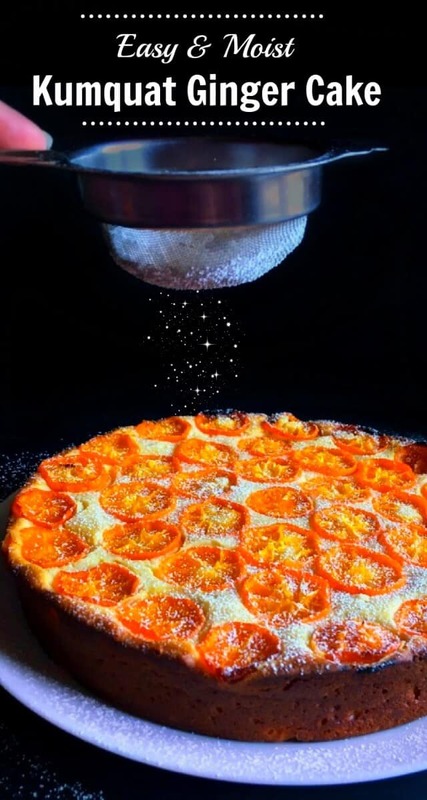 My grand mom use to make a delicious kumquat cake. Love the flavors you have here especially the ginger. What an adorable cake. 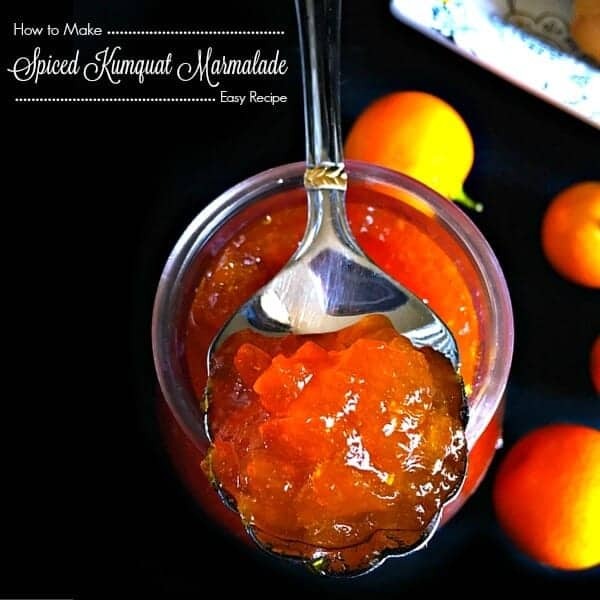 I’ve yet to taste a kumquat — I’ll have to keep an eye out for them and try out your recipe. This is the year I said I was going to expand my taste experiences. Now ginger I’m familiar with and I really love the taste. I’m pinning. What a BEAUTIFUL cake! Love the flavors of kumquat and ginger together. Can’t wait to try this!